(1) High quality 100% polyester tight woven fabric. (2)Package Includes：1 size 84"x72"（W214cm x H183cm）Bath Curtain， 12 pcs free Shower Hooks. 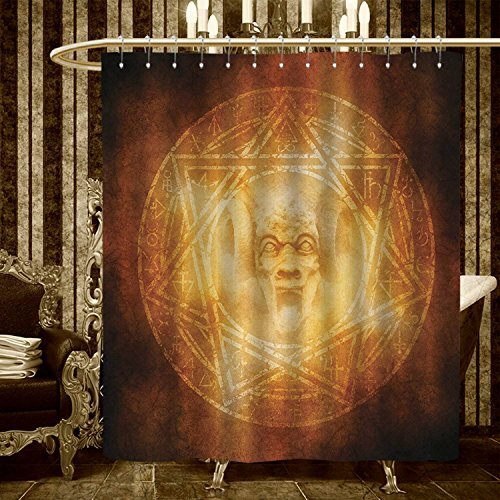 (3)No color fading in time.No color fading as you use the shower curtain thanks to the new digital printing methods. (7)Waterproof and dries fast after you take a shower,Easy to use. (8)Easy Install and Care,Adds real value and depth to your bathroom decoration. 1. Bath Curtains Fabric：made by tested polyester fabric,Antibacterial,water repellent, which is made to withstand moisture-rich bathroom environments. 2.No color fading in time.No color fading as you use the shower curtain thanks to the new digital printing methods. 3.Easy Care: Machine washable ，cloth will not be easily damaged. 5.Satisfaction Guarantee : Superior Quality ,Durable Shower Curtain no questions asked money back guarantee as well as an Outstanding after-sales service.